Sushi, a representative of Japanese cuisine. Born in Japan, ‘寿司-sushi’ has become a word known all over the world. At this exhibition, another world of sushi is created by focusing on this Japanese content from the entertaining point of view. 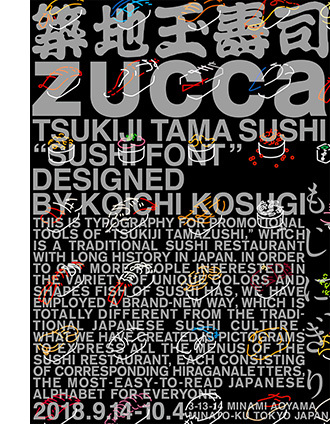 The typography was designed by Koichi Kosugi for Tsukiji Tama Sushi, a traditional sushi restaurant with a long history in Japan. We aim to express a new sizzling sensation which you cannot experience through photographs by putting the sushi into shape with letters. Breaking through the image of sushi and focusing on the unique colors and shapes, “SUSHI FONT” is a totally new visual entertainment from the traditional Japanese sushi. T shirts (9 different designs), tote bags (2 designs), and tenugui towels will be available at CABANE de ZUCCa Minami Aoyama store from Sep. 14th. Enjoy the transformation of “the” sushi into Japanese pop art at our exhibition. For more information please check our official Instagram. SUZUKI HUSTLER, Shiseido '50 selfies of Lady Gaga', KIRIN Beer 'Ichbanshibori', PARCO 'Parcoala', ZUCCa, en japan ‘en tenshoku’, Gaudi X Takehiko Inoue special exhibition, Gaba, 2013 Tokyo International Film Festival art direction, 'B&B' book store, etc. Tokyo ADC (Art Directors Club), JAGDA New Designer Award, CANNES LIONS Gold Lion, D&AD, NY ADC, ONE SHOW, ACC Award, JR Poster Grand Prix First Prize, Asahi Newspaper Advertising Runner-up Award, Galaxy Award, ADFEST Grand Prize, Busan International Advertising Festival Grand Prix, etc. Copyright © 2019 A-net inc. All Rights Reserved.